TMG helped Christohper’s Fine Jewelry and Rare Coins craft a new look for the gold buying commercials. TMG produced, edited and wrote the copy for Fireplace Superstore’s Patio Furniture commercial. TMG’s full video production capabilities provided Amish Haus Furniture with an upscale TV shoot within their budget. Printed postcard to announce special offer. TMG handed graphic design and copywriting. 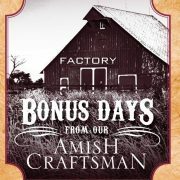 Amish Haus experienced an increase in sales from this promotion and direct mail piece. Fireplace Superstore asked TMG to help increase awareness of all product lines. TMG developed this 12-page mailer showcasing their hearth, grill and patio, and art gallery lines. 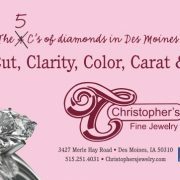 TMG is helping Christopher’s define a new look and messaging for their bridal jewelry division. Check back for more additions to the brand! Keyboard West Studios was looking to increase the demographic range of their customers. TMG developed the headline and copy as well as the design. 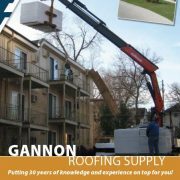 Gannon Roofing needed a sales piece that would showcase all the products they carried in an easy-to-use professional package for their sales staff. TMG delivered. This pacakage includes a presentation folder and three sales sheets, each focusing on a product line. TMG provides design of the navigation map, copy writing and programming for impressive web sites at a fraction of the cost. Watch for new links soon.